Last week's challenge for the Inner Mean Girl Cleanse was a big one for me. Christine & Amy challenged everyone to ditch our inner perfectionists and ahievement junkie. Whoa nelly, this is a big one for me. I can be a Perfectionist with a capital P! Truth be told I consider myself a recovering Type A personality - some of my perfectionism has started to wane. But it's definitely still there, and it manifests in my work (usually a good thing), and sometimes in my parenting and relationships (not so good). The week this email came was the absolute worst one for this challenge for me. Continue reading. 1) Under promise. Over deliver. So my worst week situ with this challenge: I had a deadline for an article, and of course I can't "Go for the C" with my career! 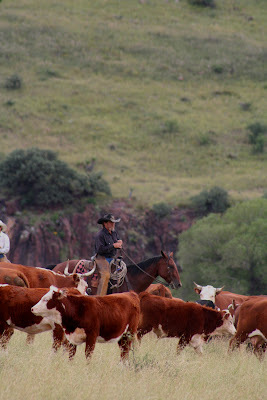 I also had a trip planned to West Texas, and had already waited until the last minute to plan everything. There ya go, maybe that IS my "C." I've been working at breakneck speed the last few months. I have had deadline on top of deadline, week after week, and truth be told I do not work best in that kind of situation. I like deadlines, and even work pretty well under stress generally, but when it's one on top of another with NO break whatsoever I feel like my creativity suffers. As I mentioned before, I like to be able to write something, and let it sit for a few days. With quick deadlines I don't have that luxury. Interestingly though, I feel like this IMG cleanse is really helping my creativity. Despite my busyness, taking both my morning meditation-prayer-journaling time, and the time to do the Inner Mean Girl Cleanse to work through thoughts and issues, means I've had a lot of insights, and have been in a really good place generally lately. 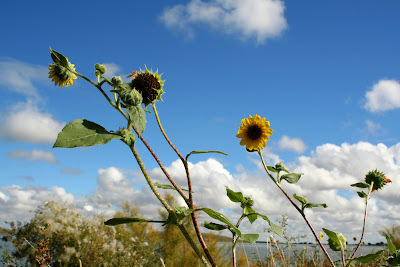 Lots of joy, peace, gratitude and contentedness with life in general and how it's going. Sure, there are day to day stressors, and issues that come up but I just feel happier and more abundant than I have in a while! What I think I'm realizing is that I need to make sure to keep the balance in my life between work and play. I have a tendency to get overloaded on the work end of things (though I have to say, much of my work - especially the traveling part - is pure joy!). So here's to slowing down, being deliberate in what choices and assignments I take on, and spacing out deadlines a bit more. I am listening to the audiobook of "7 Habits of Highly Effective People" by Stephen Covey while in my car and I don't consider it chance that I heard this part of the audiobook right during this week of the IMG Cleanse related to Perfectionism and Overachievement. Covey talks about a quadrant d ividing out life's activities based on two criteria: Urgency and Importance. There are items that are urgent & important, urgent & unimportant, not urgent and important, and not urgent and not important. Importance is defined by items in line with your personal mission statement (which can include work related items, family, personal growth) and is of course different for each person. 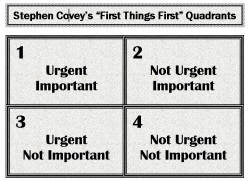 Covey says we need to spend most of our time in Quadrant 2 activities so we're not driven by the tyranny of the urgent. If we devote more time to Quadrant 2 activities, Quadrant 1 (urgent, important) will diminish because one of the most important Quadrant 2 activities is planning! Other Quadrant 2 activities are developing professional knowledge, implementing systems, and relationship building (so while someone might initially think that talking to a friend, or developing relationships in bible study or even business meetings are unimportant, to the extent you are building relationships, they are very important. Of course, some meetings are totally useless... it all depends on the situation. I think that I need to become better organized, and spend less time in brain-numb-time-waste activities, like Facebook. As much as I LOVE social networking on Facebook, I need to manage my work time more effectively. So that's my goal. I think that by using my time more wisely, I will spend more time able to let go of the details a bit more. On another note, I actually did take the advice of "go for the C" in my West Texas travels (mostly due to not enough time to plan more), and we had all kinds of humorous misadventures as a result. It's all good though - everything worked out just fine! With a little prayer and some backup plans in the pocket, we had a total blast despite a rental car breakdown and inability to get a hold of two hotels (get this - when it rains, the phones go down in West Tex - For Realz). A good choice of travel companion and lots of laughter are also key! Laurie is the best! I will post some photos and blog about our trip when I get a chance. I'm off to the store to shop for my son's birthday party this weekend! A herd of bighorn sheep on Elephant Mountain. Self-portrait on Elephant Mountain. Having a blast! Slippery steps... The spring pool at Balmorhea State Park that stays 72 degrees or something like that year-round. 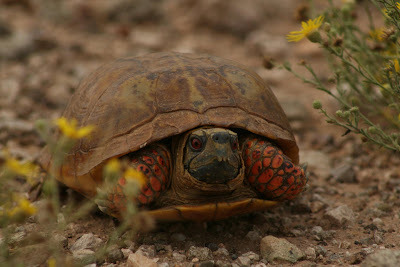 This is some sort of very colorful turtle - blue head, red eyes, orange arms... I'm not sure what species. Anyone know? 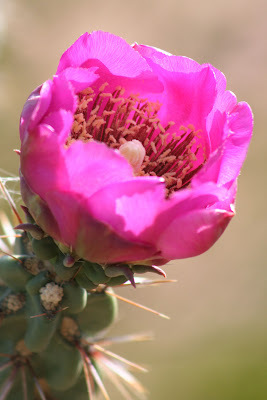 A Cholla cactus in the Chihuahuan Desert of West Texas. Laurie is such a fun person and I love her laugh and I am very much looking forward to this trip. I'm off to report three different stories, and love traveling on a magazine's budget and not my own penny! :) Here's our tentative itinerary. Realistically, we will probably only arrive for the book signing part around 5pm, but my friend Laurence Parent, a truly phenomenal photographer, will be there, as will Texas Parks & Wildlife official photographer Earl Nottingham, who has shot for several of my articles for the magazine but I've never met him in person. After the book signing, we are going to dinner somewhere in Alpine. Wyman Meinzer was the keynote speaker but he spoke today not tomorrow. I met him when we both gave guest talks at the University of North Texas Nature Writing Conference in 2007. 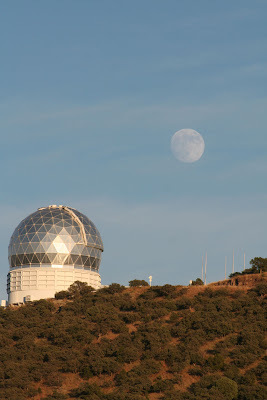 After dinner, we'll head to the McDonald Observatory for their Saturday evening "star party." I covered this in my Top of Texas article so Laurie & I visited before but it's awesome! We were there in November last time, and the constellations I learned I still vividly remember now. They have benches outside, and several telescopes and they have a guide who teaches visitors about what to expect in the night sky after dark. 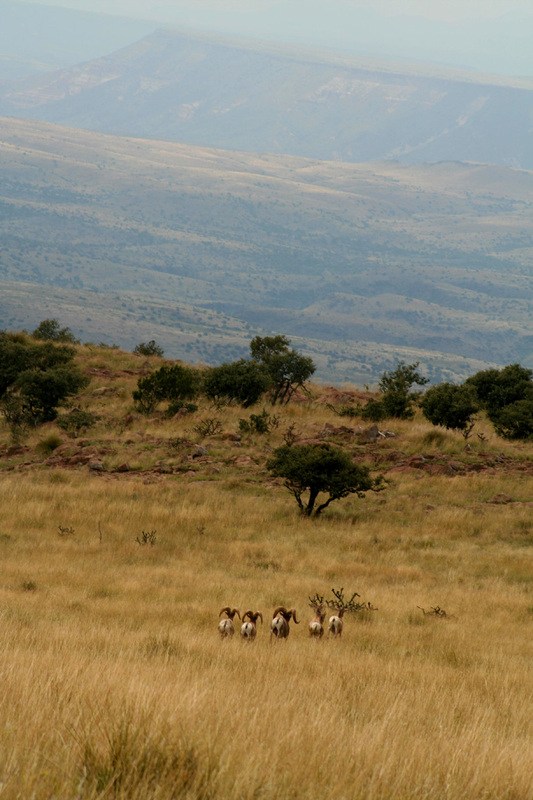 Astronomers come here from around the world to study the stars, as it has several powerful telescopes (not for your average visitors - for scientists). Last time we actually stayed overnight at the lodge there. This time, we will be staying at El Oso Flojo Lodge in Balmorhea Saturday and Sunday(the rooms look pretty nice), and then at the San Solomon Court lodge at Balmorhea State Park on Monday night. 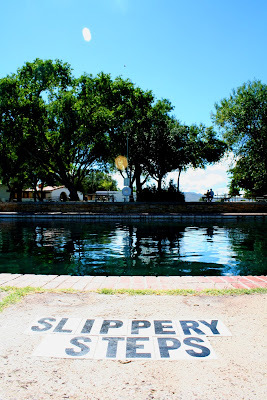 Balmorhea State Park is renowned for being an "oasis in the desert" (the Chihuahuan Desert as a matter of fact) with a gorgeous, clear, blue cold spring that you can swim, snorkel and even scuba dive in. I'm actually thinking about diving if I can swing it! Just got off the the phone with Neta, owner of the Toyahvale Desert Oasis and Funky Li'l Dive Shop. Sunday, a guide from Davis Mountains Education Center (DMEC) is taking us birding in Balmorhea State Park and nearby Lake Balmorhea. 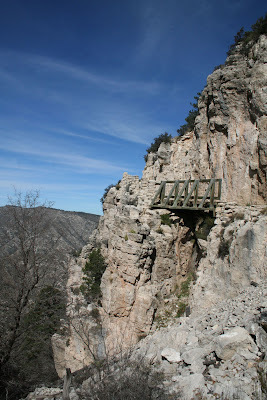 We also may go to the Madera Canyon Trail, a property owned by The Nature Conservancy in the Davis Mountains. After that, we'll head to Balmorhea State Park's San Solomon spring to swim, snorkel or dive and lounge about until that evening when Jenny from the DMEC Lodge is making us yummy fish tacos for dinner! They have lodging and food but we're not staying there. Maybe next time! 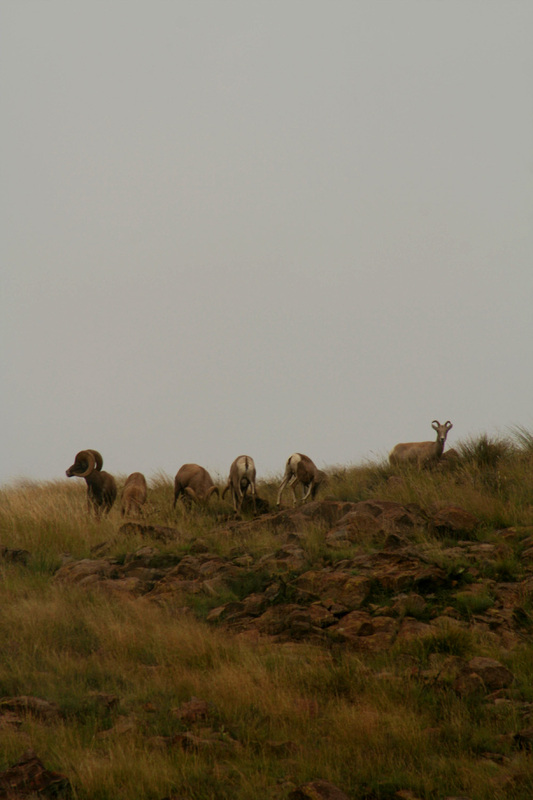 Monday, we're headed to Elephant Mountain Wildlife Management Area to traipse around looking for bighorn sheep! 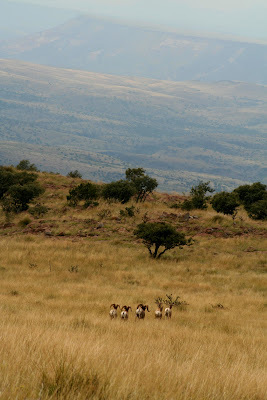 I am doing one travel article, and one piece on bighorn sheep. They reintroduced bighorns here in West Texas, after they were basically exterminated from the state many years ago, and they've been going great guns ever since. After a day hiking if we're not completely about to collapse, we're going to drive around some of the scenic routes (it's part of the Texas Mountain Trail) and maybe even get a massage if we can find a good spa! 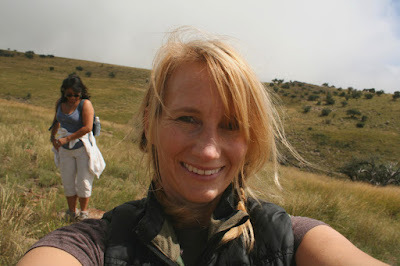 Tuesday, we're meeting up with Beth Nobles, Director of the Texas Mountain Trail program of the Texas Heritage Trails Association. We met her last time we visited too. We don't leave until around 6pm, and this day is kind of flexible and we may head back to Midland and go to the Museum of the Southwest or we may go to the Chihuahuan Desert Research Institute in Fort Davis although that's the opposite direction of Midland! It's my son's 14th birthday and I'm about to take him out to the Happy Buddha Japanese steakhouse - one of his faves - then over to his dad's. I'll post some pics from the road if I can! NOTE: On this one I pretty much followed the recipe. The only thing different is that I used red onion because that's what I happened to have but I would really recommend a white or yellow onion. I also used a Merlot and it was a bit too strong in the sauce for my taste. I'd almost try a cooking sherry but you can experiment. I also used about 5 or 6 garlic cloves. I love fresh vegetables! 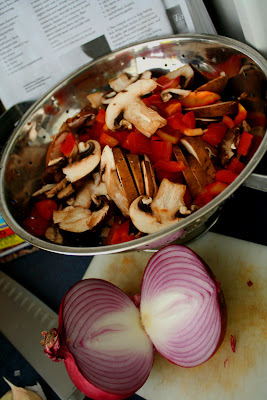 Oh that reminds me, I added a red bell pepper to the recipe in addition to the mushrooms (Baby Bellas) and the red onion and garlic. Here are some of the ingredients I used. You can see I like to buy stuff that's on sale! 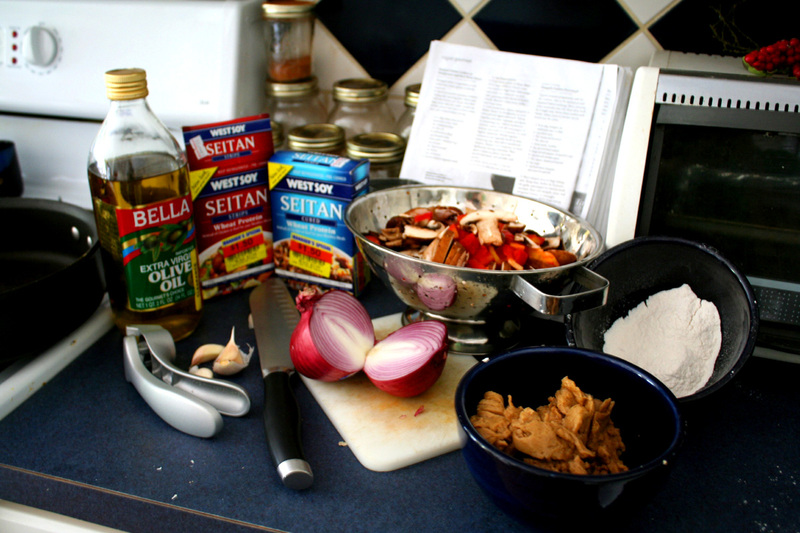 The Seitan comes in plastic-sealed packs (inside the cardboard packages), and even though the package expiration date was in May, and I kept it in my fridge until... September, it was still good. I did the sniff test to make sure but it smelled fine and upon cooking tasted great! (I promise if I open an eatery I will not use expired food!) :) The stuff in the bowl on the right front is the seitan - it was pretty tasty! 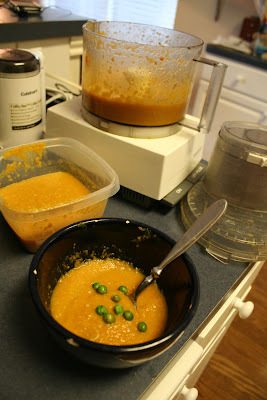 The silver thing on the left is my Pampered Chef garlic press, which I LOVE. In fact I love all Pampered Chef products I have ever bought. 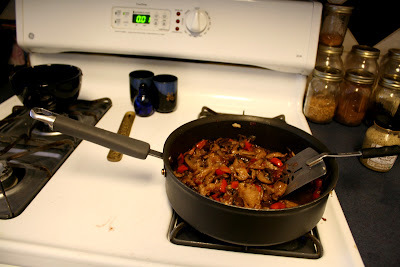 I have had a few "parties" and gotten lot sof their products - I have their cookware, which is great, their stoneware, and lots of other things. I don't sell it, but I probably should! These are ingredients of the sauce - the (organic!) dijon mustard, thyme (I freeze the fresh herbs), cornstarch, vegetable broth (I use a garden veg broth bouillon cube thing) and red wine. That's a Pampered Chef cutting board which goes with the food chopper by the way! 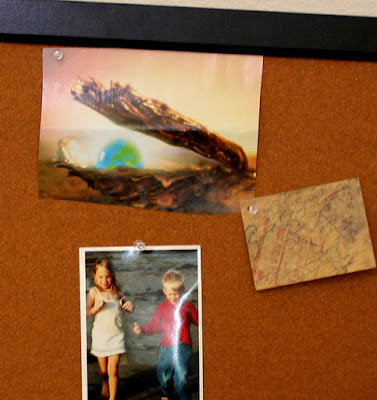 I decided to add something small to my vision board. I have a collection of magazine clippings in a plastic baggie for use in making my journal collages, so even though I plan to do some serious magazine page browsing sometime soon, in order to really fill out my vision board, I wanted to place something on it (other than the photo of my kids, which I love, but that was already on the corkboard). I went through the clippings and the image that spoke to me most was the one of the world/globe inside the oyster. I like the imagery it represents and the marble earth is so beautiful too. I also had this tag from some pants I bought that looks like a map, and I have always been drawn to maps. It has "passport stamps" on it as well so it went on the board too. In The Artist's Way book, Julia Cameron says that as you continue to read it and do the exercises within, as you reconnect with your creativity, you may find yourself doing new things, wearing new or slightly different clothes (or resurrecting old ones). That has happened to me again as it did in the last time I did this a couple years ago. I mentioned that I've been making changes around the house - like painting my kitchen wall yellow, painted my bathroom ceiling, etc. I also rearranged my closet to make it more spacious - and I LOVE to see the difference every time I go in there (it was quite cluttery before). In the process of rearranging the closet, I found some old skirts I hadn't worn in a long time, and I've been wearing them lately. 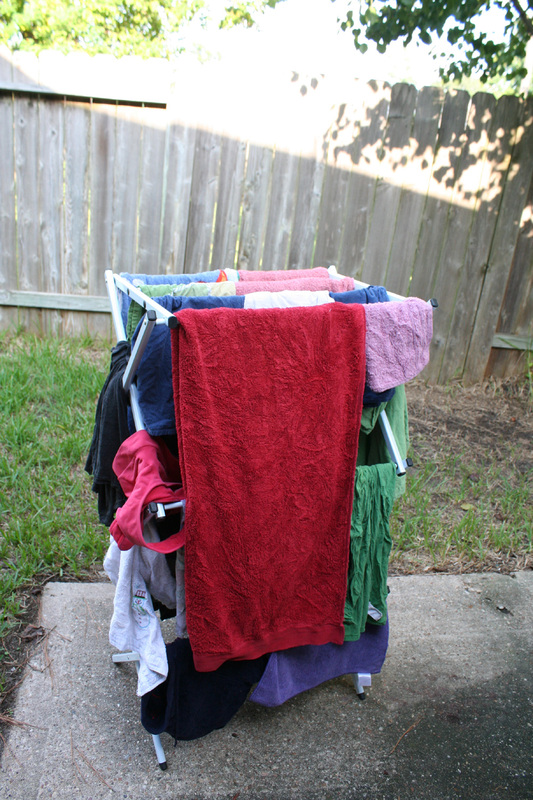 Related to making small but practical and helpful changes to one's life - one thing I've wanted to do for a while now is to start air-drying my clothes to save energy. 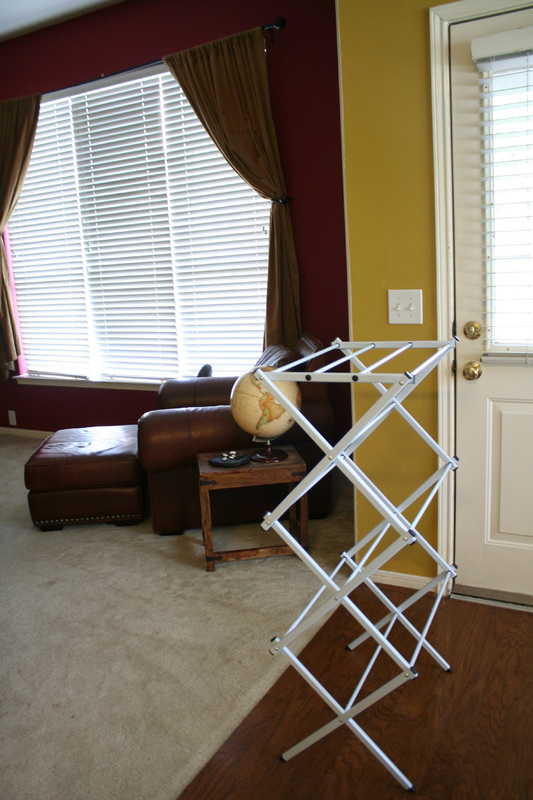 I used to have a wood drying rack like this but it broke and I never replaced it. Until the other day! When I was at Target I bought this metal one. I've used it twice now. Savie did not like the way her clothes felt all scratchy... I used to actually think that way too when my exes' mom used to dry the clothes out on the clothesline, but I have found I don't mind anymore. They smelled really good and fresh! And I'm helping the polar bears. Speaking of polar bears, I have two articles out that I want to point out and link to. Please check them out if you can, and leave comments there. I love comments! The last thing I'll mention is that tomorrow 9/16 there's a Free SARK and Marney Dream Boogie telecall *How your Inner CEO and Inner Spirit can get along* at 9pm ET - or you can get an mp3 to listen to at any time! 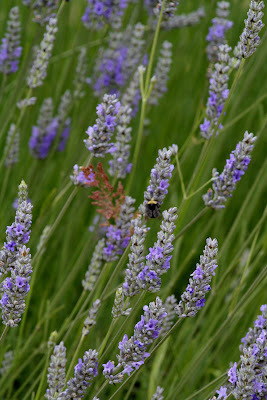 Lavender at Green Gulch Organic Farm, Muir Beach, CA. This week's Inner Mean Girl Cleanse "Dare" was to face-down our Inner Obligation Queen - to not take on tasks or do things that we really don't want to do. If you do it, do it from love. We were asked by Christine and Amy in the weekly newsletter to 1. Say No and 2. Act from a place of service to what and who is truly important to you. Sometimes it's something that you really don't have much choice over - perhaps taking care of an elderly parent, or cooking dinner for the kids, or whatever the case may be - the dare is to shift your inner attitude from negative vibes associated with "I have to" or "I should" to the awareness - first that almost everything we have and do stems ultimately from choices we have made, and two, we can shift the negative vibe that goes with obligation to gratitude by realizing most of these obligations are actually a great privilege. Those responsibilities we have, we should offer our actions out of love. So simple, yet so powerful. I LOVE the concept! I have to be honest - I know a LOT of women struggle with this, but me? Not so much. I usually don't do things I don't want to do, and I truly enjoy most of the things I choose to do. I have always (until recently!) kept my kids in only one activity at a time, so for the most part so neither I nor they wear ourselves into the ground. I like to choose activities I know I can fully commit to, and I am very good with follow-through. If I start a 10-week bible study, you can be pretty sure if I'm in town I will be there every week and I will have done my homework. And I actually love doing things for my kids. I get super busy and don't cook every night but I actually love to cook, and enjoy simple things like making them their lunches for the next day (they may not realize this, but I do!). I like keeping my house clean and tidied up -it gives me pleasure and joy! So I'm a bit odd, what can I say. Wow! Funny how this happens!! As I'm writing this right now, I literally just realized HOW true it was that I stayed in my 20-month relationship out of obligation rather than truly believing it was the right thing! Wow! Why did I compromise my principle there, when I don't for so many other things? Hmm. Ah-ha moment happening right now!! But I digress... What I had intended to mention was the one thing that did come up and I did take the Dare head-on. I didn't have my kids this weekend, and as much as I adore my kids and having them around and their fun, boisterous energy, I also really enjoy and cherish my alone weekends. I work, I exercise, I talk with friends, and I rest. So when Sunday came, I felt "I really SHOULD go to church." As soon as I thought "should" I went A-Ha! I realized... No. I. do. not. To be honest, I have been struggling over whether my soul can really worship as well in the church I currently attend. I LOVE the bible studies and programs I'm engaged in there, but the service kind of bores me. I like the music most of the time, but I start looking around the pews at who is there, and not focusing on worshipping. So I may start to church-hop sometimes soon but I decided to stay home this past Sunday. It was very freeing! (But again I have to admit it wasn't the first time I've skipped church). I did know that I had a bible study I was starting that evening and so would have another way to worship through learning. It's a Beth Moore Living Beyond Yourself (LBY) study that just started this week. I was present when she recorded the series downtown at Lakewood church and she is sooooo amazing and Spirit-filled and she inspires me to be a better person. And the weirdest part is that it was 2003 when I did this study, and that was right before I moved out from my marriage... so it is going to be somewhat poignant for that reason. How far I have come, and how much my Spirit has grown! It's funny that I blogged just 2 days ago but so many things have already happened since then. I had a fantabulous weekend. Friday my friend Elise and I went to spin class, and then she came over and she made me a vodka sour and we watched the movie CityIsland and talked through half of it! Saturday I had the Inner Mean Girl Reform School Open House telecall - which was awesome and there were some real gems. I'll blog about them in a future post. You can listen on Wednesday (even if you're not signed up for the Cleanse) - it's a 90-minute call at 8pm EST and it's free. If you can't make it at that time still sign up as they'll send you an mp3 of the call if you miss it. I had a powerful experience yesterday where I felt the overwhelming presence of the Lord, where I had no choice but to fall down on my knees and cry tears of joy. I know it sounds a bit whack to write or read that, and I have to say that this was a new one for me. It was absolutely profound, and there are really no words to describe it, but I will say I have had a real sense of joy in my Spirit over the past few weeks and am feeling alive and excited and spacious about so many things. And then this morning, I was doing my daily LBY bible study workbook, and right in front of my eyes was a lesson that made me realize that something I was so absolutely sure I was right about, I wasn't. What happened, the thing I didn't like at all, it turns out the Lord told me plain as day (though the study) this 'thing' was His will! Cuz God is just cool like that. :) Below is a slideshow Youtube video of the song I was worshipping to at home when the moment happened - may the song bless you as much as it has me! My mind has been ripe with ideas lately. I always find that when I'm engaged in various activities, reading books, doing bible studies or other spiritual practices that it really energizes my soul and spirit and makes me feel more alive and more creative (something that sort of had died down over the past couple years). As I mentioned, I've been doing the Inner Mean Girl Cleanse and I've started re-reading The Artist's Way and doing some of the exercises within, including journaling every morning (the author, Julia Cameron, calls them morning pages). Today I started the Beth Moore Bible study at my church, Living Beyond Yourself, which is on the Holy Spirit and specifically on the fruits of the Spirit (love, joy, peace, patience, kindness, goodness, faithfulness, gentleness, and self-control). I was actually present when Beth filmed the video series back in 2003 so this is my second time doing the study. That was the year in which I separated from my ex, so... it's somewhat poignant being here in the same study in a completely different place. And hey I just realized you can do the study online - check out the link above, if you're interested. 2. Place lettuce leaves on platter, and set out garnishes in small serving bowls. Wrap tofu mixture in lettuce leaves, and top with your choice of garnishes. 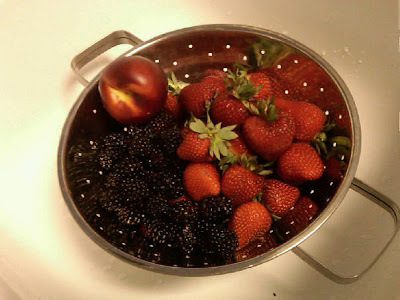 Another thought process coming out of all this idea-ripening is that I may start another blog just focusing on healthy eating, cooking, healthy lifestyle stuff. What should I call it? I have to have Bohemian in the title I think. The Healthy Bohemian? I will have to see if my talented daughter can help me design a blog template. She is so incredibly amazing in that department. She's redesigned her own blog about 10 times and I love them all! She's a super talented photographer, and good with the graphics design programs, is in photojournalism and yearbook in high school and well I just can't say enough good things about her. And she has an incredible passion for orphans around the world. And I have to mention my super-smart son who just started high school and who turns 14 this weekend - wow!! They grow up so fast! I love them both to pieces. 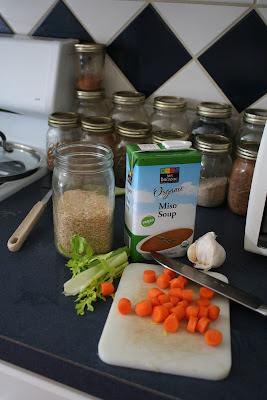 I have tweeted about Stone Soup before, but this is a photo when all the fresh ingredients are just starting to cook. I call it that because of the popular children's book but it's the recipe I use coming off the Master Cleanse, and I make it now and then because it's super healthy and yummy too. I just throw in whatever I happen to have in my freezer or fresh produce drawer at the time - usually things like frozen butter beans, corn, celery, okra, spinach, tomatoes (or salsa), leeks, onions, and then I add in quinoa, millet and/or rice, as well as lots of curry and turmeric and a touch of cayenne pepper and salt. So there ya go. Throw it in the crockpot and let it cook for 24 hours. Today, I was at Target shopping for my son's birthday present and I came across this towel which was on Clearance. 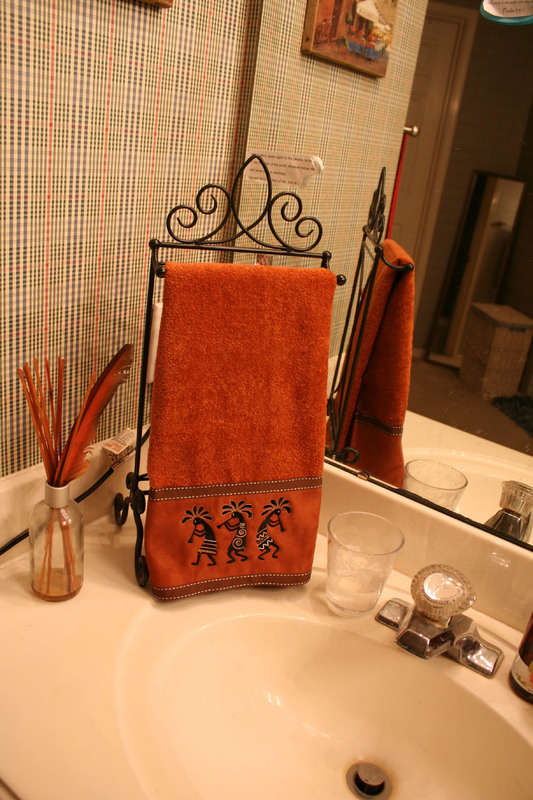 I needed a new towel for my bathroom because I have a white one I got last year and well that didn't work so well, with makeup and such getting wiped on it... It's amazing how very simple changes can make a corner of your bathroom look so much happier! OK I'm easily delighted, what can I say. My last pic of the day is my blank Vision Board... obviously it's just a corkboard now. But I have been wanting to make a Vision Board for along time and the time is now! I got this out of my closet and bought some thumbtacks today (all the ones I have are used up on my map of the world - I put tacks in the places I want to go, and the places I've already been). My talented and inspiring friend Jessica - who owns the clothing/shoe manufacturing company Joyfolie - was talking about her Vision Board and it inspired me to start my own, finally! I hope to blog again tomorrow or Tuesday about the totally inspiring and helpful live Inner Mean Girl Reform School Open House tele-call from Saturday. They're offering another one Wednesday - so whether or not you've signed up for the free Inner Mean Girl Cleanse, you can call in for this and get some good nuggets of wisdom! 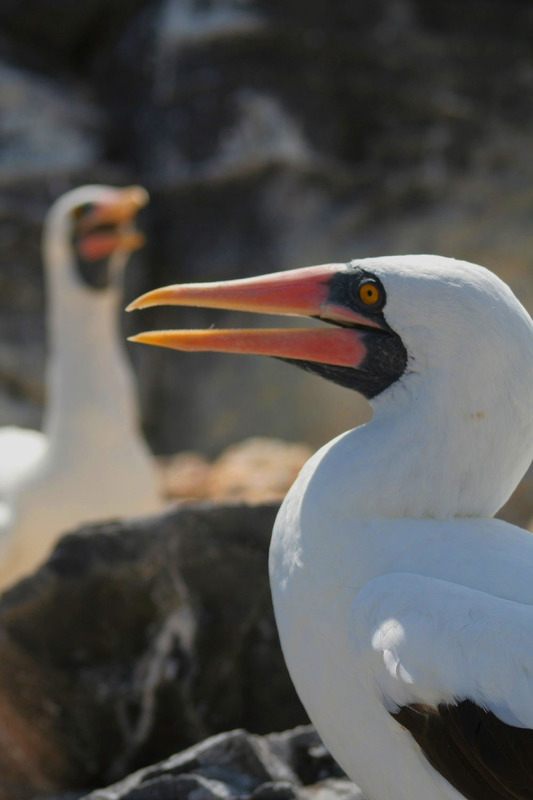 Nazca boobies in the Galapagos Islands. Welcome to week two of the Inner Mean Girl Cleanse! 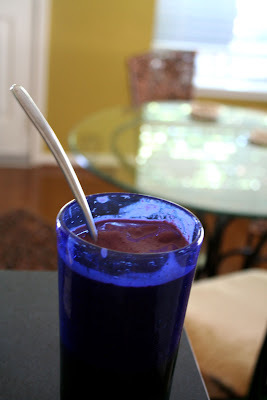 So this past week of the cleanse - which runs from Wednesday through Wednesday - focused on comparison. The weekly email started with these sage truisms about our inner comparison queens, "One day she's wielding her Inferiority Complex, comparing your worst to everyone's best. Making you feel small, inadequate and like you're a failure. And the next, she's in her Superiority Complex, giving you the illusion that you're better than everyone else. Making you feel alone, distant, and cut off from compassion and humanity." * In what situations does your comparison queen show up? * Do you see more of the Inferiority Complex or the Superiority Complex? 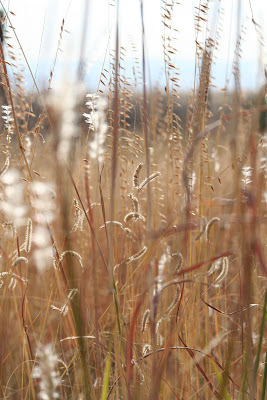 * What does your inner wisdom know about comparison? As I reflected on these issues in my own life, I found that I have a fierce tendency to compare myself to my past self, especially with my body. Who hasn't thought of what it would be like to be 'high school skinny'? I'm a 40-year old woman who has had two kids, blessedly has no stretch marks, works out several times a week, eats healthy and yet sometimes I kill myself mentally over my imperfections. I really don't find myself comparing myself to other women's bodies, other than sometimes wishing I had this or that for myself. I tend to think 'Good for them for working hard to look beautiful and stay healthy'! But I'm hardest on myself. I also find in my career, if the words aren't flowing, or I don't feel inspired or my writing doesn't read as well or with my unique voice, I compare my writing against my own better articles. And I think my inner wisdom knows that I need to stop it! :) I have a bad tendency to be perfectionist, and that can create all sorts of mental circles and loops I have to circumnavigate before I can be satisfied. I'm trying to just let go, and do my best. The Inner Mean Girl Cleanse challenged us this week to think about what area we are rich in, “What is overflowing in your life?” and as I thought about the question my answer was very clear: friendship. I have so many friends, men and women, who are so kind, generous, fun, inspiring people and they live all over the world! That means when I travel I usually get to connect with people and share lunch or coffee or a hike in the forest, or a couple weeks stay sometimes. And then my friends here in Houston are just a truly amazing group of people also! So if I feel a lack in one area, I refocus my mind to the blessings. Affirmation of the Week: "I am inspired. I easily appreciate myself and others. I am Grateful!" I made the most delicious soup this week and I thought I'd share the goodness. I made some modifications but it was sooooo good, healthy, and even my daughter liked it! (My son wouldn't try it but that's typical!) Above are most of the ingredients though I didn't have the leeks in the picture. I am a huge fan of leeks since I tried them out for the Baked Leek and Sweet Potato Gratin recipe I shared before in the post bread of life. 1. Heat oil in large pot over medium heat. Cook leek in oil 7 minutes, or until softened, stirring occasionally. Stir in garlic, and cook 1 minute more. Add vinegar to deglaze pan, and cook 1 minute. 2. 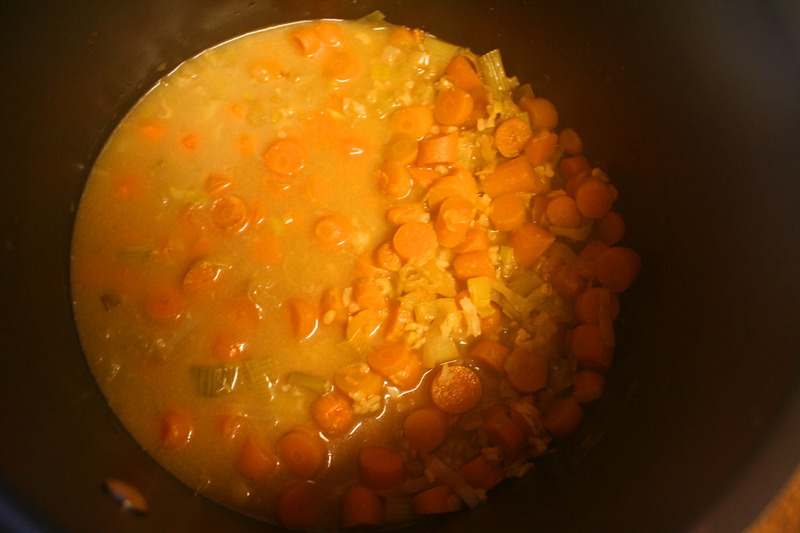 Add carrots, rice, kombu, and 5 cups water. Bring to a simmer, cover, reduce heat to medium-low, and cook 30 minutes, or until carrots are tender. Remove kombu, and blend soup until smooth. 3. Spoon 1 cup soup into small bowl. Whisk in miso and agave nectar until smooth. Whisk miso-agave-soup mixture back into soup. Serve soup with wasabi peas sprinkled on top. 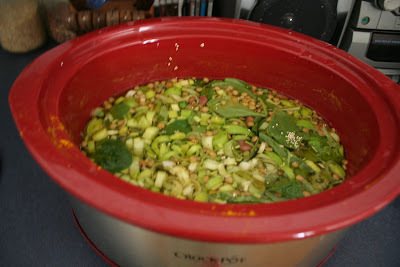 You boil it up on the stove, and this is before it was pureed. The way I modified it: I did not use the piece of kombu or the miso concentrate but instead used the miso soup from the carton I had, which happened to be made with kombu. Since it was liquid and not concentrate, I used less water. So I think it was like 3 cups I had of the miso soup stuff and 2 cups of water. I used two cloves of minced garlic because you can't use too much garlic! I also didn't have wasabi peas but had these dried tamari peas and I don't recommend that... the soup was GREAT on its own. It may have been good with wasabi pea garnish but it's definitely not important. Oh, I used brown rice instead of Jasmine (white) rice. One more thing - I also added in some celery! I forgot to mention that. I use the Cuisinhart I got as a wedding gift in 1993! I LOVE that thing!! All I can say was Oh. My. Gosh. 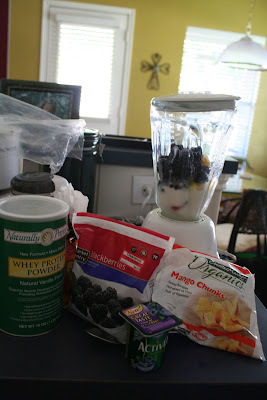 This is soooo yummy and I'll definitely be making it again! I wanted to include another shot of my yellow wall which I love! It looks much better in the light than in the fluorescent lighting which brings out the greener tones. 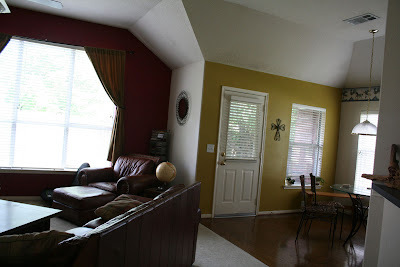 You can see how it looks next to the brick red, and the wood floors. I love being in the kitchen now - the wall makes it so sunny! The border that you can see to the far right was also on the wall that is now yellow, and that's the one I originally wanted to remove from my entire kitchen. But it proved very difficult and the blue wallpaper remover stained the wall blueish - hence the need to paint. I'v been very busy working on an article about the oil spill, and I just booked a flight for a trip to West Texas mid-September for a couple articles I'm doing. I've been a busy girl!